“Surgery is not just science. Surgery is an art”. This is written on the corkboard hung behind the desk. After all, also colleagues think of him as an “atypical” surgeon. Because he does not just carry out the required technical action, such as fixing an intestine or removing a cancer, with deep and punctual concentration. Andrea Bondurri, the 40 year-old medical executive of the Surgical Operational Unit in Milan’s Hospital Luigi Sacco, also loves to talk with patients and is always moved by an healing struggle or the sorrow of an accident. Bondurri was born in Luxembourg City. Being also a scoutmaster and a lecturer, he shows a strong practicality, clear in his choice to become surgeon in order to immediately face problems and solve them. He is one of the Italian young representatives of a new vision of medicine, considered as a modern science combined with its ancient humanistic soul. “General surgery is still a discipline where patients can be given a lot of attention” – explains Bondurri –. If the body suffers from a disease, this can be detected only by talking with the patient. In this way, the doctor is able to decide which may be the best clinical pathway and how to recover the right quality of life”. “Sometimes, people complain about the impossibility of having immediate access to an expensive exam. Nevertheless, when the patient is well followed by the doctor, and talks with him in the right way, the fact of choosing a gradual pathway, from the least to the most invasive operation, benefits and safeguards everyone. Usually, we do not realize how lucky we are to live in Italy”. “Our health system takes care of people and is based on paediatricians and family doctors to whom we have access whenever we want. Many countries do not offer this service”. “Obviously, the system is not always perfect and the organization is quite “Italian-style”. Maybe we don’t have printer paper but we work the most efficiently possible, with deep commitment and passion”. “In order to enhance our hospitals, doctors should be given more responsibility. People call us directors but we are not so: hospitals are managed by general directors, chosen by politicians”. “Another step forward could be a better rationalisation of facilities: not everybody lives in front of a high-intensity hospital. Some competences should be centralized and others decentralized. A birth centre with a low birth-rate is considered less safe than driving for ten kilometres to a more prolific centre, simply because the amount of activity is thought to ensure also quality and safety. We are going down this route but people need to be braver. Above all, the linear cuts’ logics cannot work. Depriving everyone of 10% of beds does not make sense. Instead, some units should have been closed or turned into clinics, leaving the others as they were. In this way, we offer higher performances. In this way, we focus only on the patient”. Indeed, a flier regarding the “Centrality of the Patient” dominates that corkboard hung in Bondurri’s practice. It is located under a quote of Francis Seow-Choen, a Malaysian doctor, who reminds the relationship between science and art in surgery. Beside it, there is a black-and-white photo, portraying the magistrates Falcone and Borsellino, heroes of the fight against mafia, together with a drawing made with markers by his three kids and stating that, despite his intensive work at the hospital, “he is always the best dad ever”. 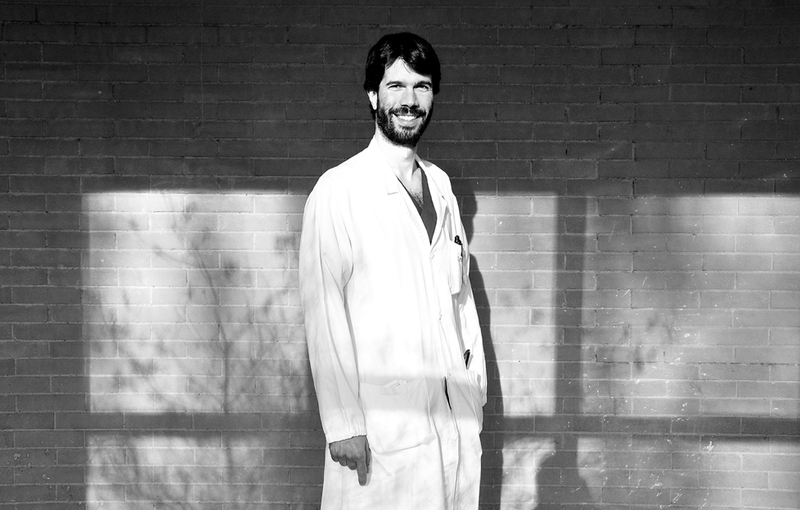 Currently Andrea Bondurri lives in Milan and works at Hospital Sacco in the Pavillion 17 in the Surgery division.